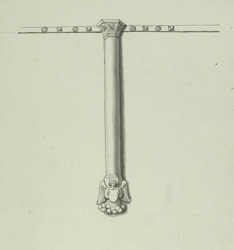 A drawing in ink of one of the brackets in Wyke Regis church in Dorset. The church was completed in 1455, replacing an earlier church near the same site. With its tall, square west tower and emphasis on sharp vertical lines, it remains an important example of the Perpendicular Gothic style of architecture. Sculpted heads of Henry VI and Queen Margaret of Anjou (monarchs when the church was consecrated) face each other across the nave.